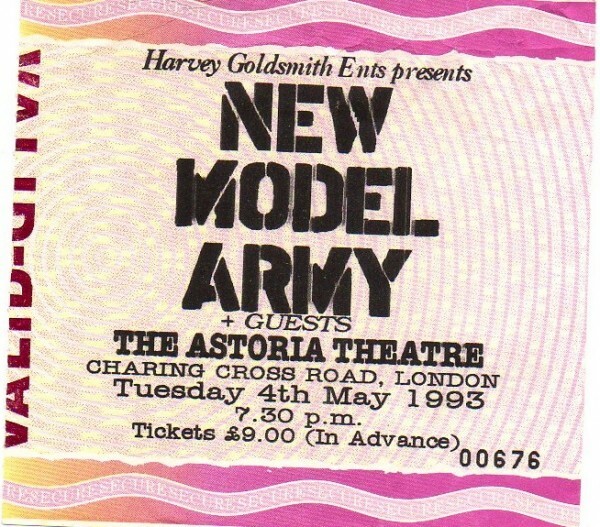 It’d been a year since I’d last see New Model Army (GIG 101) and, as with that gig, they had Ed Allyne-Johnson as a stand-alone support act for them as well as joining them on stage during their own set with his home built electric violin. 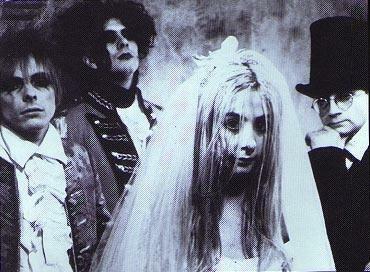 In addition they were also joined by Power of Dreams whom I think I had an old 7” single of at the time so vaguely knew. I’d just started going out with a girl called Sue just over a week before this gig and it was the first one we went to together. We’d actually got tickets (before we started seeing each other) for Guns N’ Roses at Milton Keynes Bowl for the end of May (GIG 119) but hooking up when we did meant our mutual gig-going started that much earlier. I can’t remember much about either band. Compulsion were the opening act and impressed a lot looking at my notes. They were also the more successful of the two bands getting some clubland plays both in the UK and Stateside and also individually as their guitarist (Garret Lee) later went on to become a music producer and has worked with bands such as U2 and Snow Patrol and I saw their drummer (Jan-Willem Alkema) performing with China Drum some years late. I wasn’t so keen on Fibrehead. After seeing the Vendemmian gig at the Dome we headed to the underground and the three stops between Tufnell Park and Mornington Crescent to finish the night off at Camden Palace and the ‘Feet First’ club. 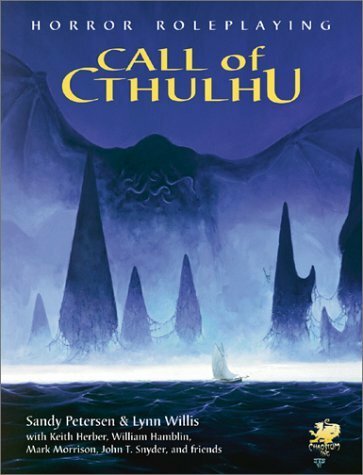 The final day (for me) of the very enjoyable #RPGaDAY that Dave Chapman created for August. I may have overrun August by almost two weeks due to unforeseen and unfortunate circumstances that meant I was away acting as ‘support’ whilst my partners brother was in intensive care, but I have finally caught up. Thanks to Dave for coming up with this great idea. I’ve really enjoyed looking at everyone’s selections and also reading the comments that people have made (both on my own posts and others). I’ve been crossposting my answers across Facebook, Google+, LiveJournal and my own blog (The Imaginarium - http://the-imaginarium.co.uk). 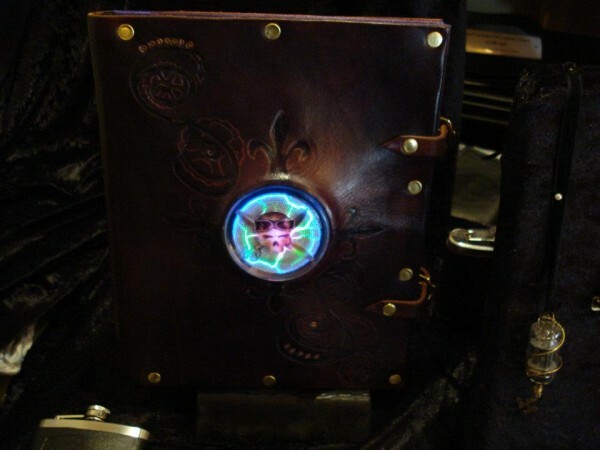 LiveJournal and The Imaginarium are the easiest platforms to see the entire series of posts due to their ‘Tagging’ systems. Rarest RPG could be taken two ways. 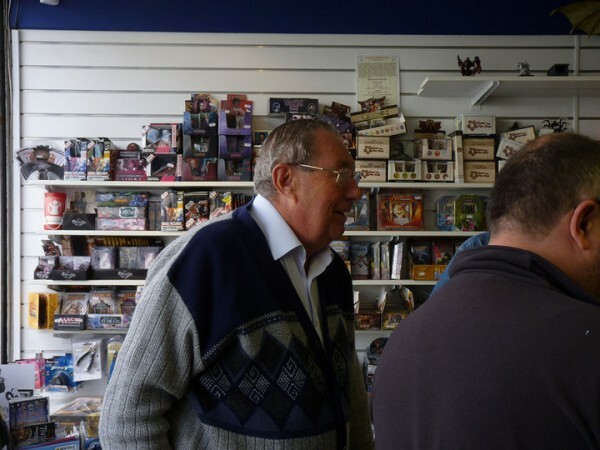 Either as a game which printed/sold so little hardly anyone has seen or heard of it, let alone ‘owns’ a copy or it could mean that it’s a “holy grail” to collectors that passes hands for shed loads of cash on the rare occasion that one becomes available. I’m however going to go with a third, rather unique, option and that’s a “Roleplaying Game which has been customised for me” – so it’s pretty much unique and one of a kind (although Julian Hayley did see my copy and promptly ordered a custom job for himself ;p). For this I’m selecting my unique and customised ‘Airship Pirates RPG’. A fantastic game by Cakebread & Walton based upon the world of Abney Park – a Seattle based Steampunk band. The game is brilliant in the first place and the core rulebook is really nice without any tinkering but I asked a couple of friends (Kate Lawrence & Nathan Gill of Bedlamites Boutique (http://www.bedlamitesboutique.co.uk) to “punk” my copy into something unique and wonderful… and they far surpassed what I had hoped for. It was in the early days of September 1985 and autumn was already in the air. I had just returned from a visit to Paris to see my grandfather who given me £10 as a present. I’d been told about a new shop that had opened about five miles away. I’m not even sure I knew its name but it was apparently brimming with games, including lots of RPGs. I was told it shut at 5pm so by the time I got home from school and my Mum had rang a taxi for me (as it’d be quicker than getting to the underground station and then getting a train) it was getting quite tight on time. Traffic didn’t help and by the time we got to the street the shop had opened on I only had a few minutes to1 go. I was almost heartbroken. I had no idea *where* the shop was – just the road name – and it was a very long road. I had been told it was ‘near’ the station but that was about it. I leapt out of the cab and ran into a newsagents to ask them about this mecca of games. They’d not heard of it and time was running out. I literally ran down the street, dodging pedestrians, trying to spot this store… and my watch was slowly passing the 5 o’clock mark. Then I saw it. I almost barrelled through the front door, panting and out of breath and gasped “Are you still open? Please don’t close!” to a bemused older gentleman behind the counter. “That’s ok, we close at 6 so you have plenty of time.” he replied. 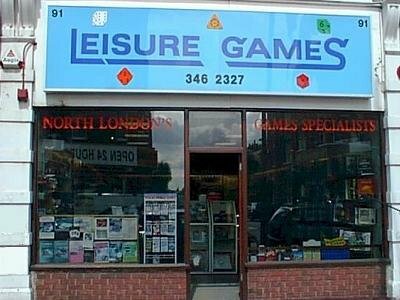 That was my first ever visit to Leisure Games and introduction to the man who started it all only a week or two before my out-of-breath entry. From that moment on I spent almost every afternoon after school in the shop, ended up helping out a bit after school and then on Saturdays when he needed cover and then when his Saturday boy left for university. He then asked me to go fulltime, something I couldn’t do initially as I was still at school but he (and me) eventually got our wish and I ended up spending a fantastic 19 years fulltime at Leisure Games with a previous 4 part-time. Tony never ever forgot the moment a young out of breath boy ran into his shop and I’ll never forget Tony. He was by far the best and most memorable encounter I’ve had involving RPGs. I owe him so much. I’ve never been truly ‘scared’ during a tabletop RPG. I’ve certainly felt ‘on edge’ in some Live Action games when I’ve either been in pitch black cave networks not sure what’s waiting round the bend (and not knowing where that bend even is!) or creeping along in a dark Napoleonic Fort’s underbelly knowing that a pack of werewolves is on the prowl somewhere wanting my vamps blood… but LARP can often be a lot more ‘immersive’ than tabletop. There are two games that could qualify I guess… The first was when we were playtesting the development of ‘The Book of Unremitting Horror’ (Pelgrane Press) when one of the players decided his character had really had enough and decided to just scarper… which to be honest is what anyone in the situations we were getting in would do if they were sane. His PC ended up (unbeknownst to the rest of us) driving out of London, getting on a ferry and leaving the country. I can’t remember what exactly happened but I think whatever it was he was running from did actually materialise on the ferry (I think he was heading to Norway so it was quite a lengthy journey) and reclaim what it was after as he’d foolishly taken an artefact or something with him instead of just dumping it somewhere before he left. 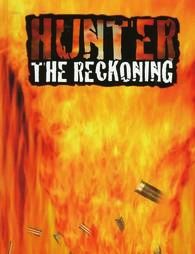 The one I’m going for though was a game of ‘Hunter: The Reckoning” that we played with characters based upon ourselves. It was fantastic (atleast Delphine and I thought so – I know a couple of the other players enjoyed it less) and pretty intense. I think it was possibly slightly more intense for me as Delphine was the type of person who would go running “in to haunted mansion to explore” whilst I am the type of person who wants to read up and study what we may about to be getting ourselves into as opposed to diving in head first. However with Delphine running into those situations it meant that I was running into them to (against my will and better judgement) because I wanted to be there if things hit the fan and couldn’t bear the thought of her in danger. It also created some great in-character arguments between us. There are lots of games that I’d like to see new/improved editions of. Some people are well aware of my interest in (Kult, Cyperpunk 2020, TORG…) but the one I’m choosing for todays entry is one that few people will be aware of outside of France. 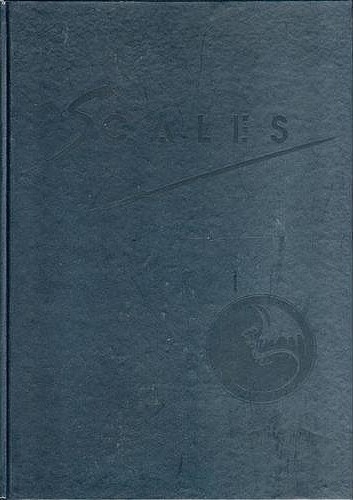 Scales was published in 1994 by Asmodee (who are now much better known as a board game publisher) and was designed by Croc, Stephane Bura and G E Ranne. It’s set in a world which is pretty much the same as ours but has mythical elements that have existed long before humanity came about on our own planet. In Scales players play the descendants of one if the 13 ‘Elder’ Dragons who, often at the beginning of the game, may not realise their true heritage as they exist in ‘human form’ and have undergone their first change. The characters are indeed shape-shifting dragons whose bloodline can be traced back to one of the great dragons – as indicated by the colour of dragon they change into (which will also dictate certain powers, allegiance, etc). In some aspects the game could be thought of as Vampire: The Masquerade but where you play Dragons instead of Vampires. Whilst this is not wholly true there are certainly a number of similarities between the two. The younger Dragons (PCs) end up at odds with their elders as they were born on Earth and consider it their home whilst the Elder Dragons came to the planet to mine it for the planets magical essence which helps power their travel between worlds/dimensions. 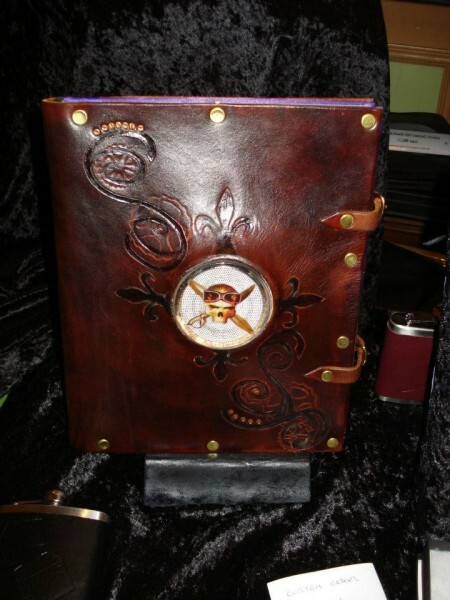 Due to the Dragons draining of this magical mana much magic has been disappearing from the world over the centuries – thus many native ‘magical’ creatures of Earth have vanished from the world and fallen into myths and legends of humanity. However some magical creatures still exist and are trying to stop the Dragons mana drain (and thus save themselves from eventual extinction). It is with these other creatures that many of the younger Dragons have more sympathy with which causes a lot of internal friction and politics with their forefathers. The original game only had four books and a GM Screen released for it (The core rulebook, Politics, Magic and Technology). A fifth book (Nature) was planned but never released. Another game set in the same “cosmoverse” was also released in 2000 called ‘Prophecy’ which is a fantasy medieval setting. Considering that the thing players use the most are Character Sheets it’s amazing at how over complicated/cluttered some can look. A nice simple and easy to read character sheet is really ideal for gaming – although some can then come across as ‘rather dull’ design wise. 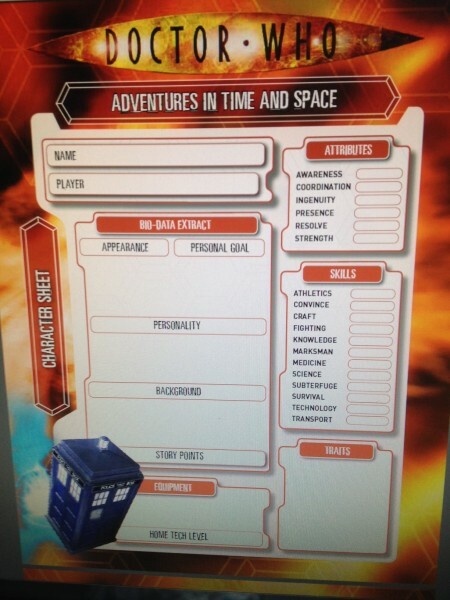 With both ‘simplicity’ and ‘design’ in mind I’m going to choose a Character Sheet that is from another game we released when I was at Cubicle 7… and that’s the Doctor Who: Adventures in Time & Space Character Sheet. That said, I’m just going to go for a game that I’d love to ‘play’ but doubt I ever will – and not necessarily because I couldn’t find players. 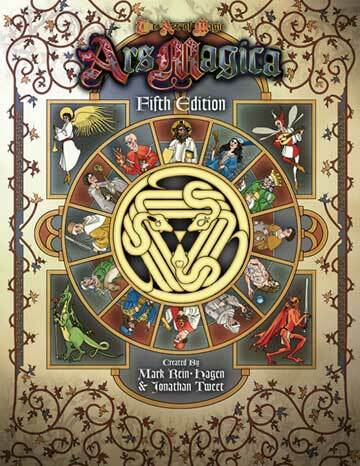 I’ve always fancied playing Ars Magica (currently published by Atlas Games but I’ve had most of the editions and supplements since the old Lion Rampant days back in the late 80’s). I not only love the setting (12th/13th Century Europe with a heavy dose of the mythic) but also the way you ‘create’ your party. Basically the game centres around a group of Magi who belong to ‘The Order of Hermes’ and live/work together as a Covenant in a stronghold. Alongside the Magi themselves the Covenant also contains various ‘mundane’ followers and assistants who help the Wizards. These fall into two categories – the ‘Comnpanions’ (who are fairly skilled in specific areas) and ‘Grogs’ (lesser skilled peasants). When you create your character you actually create a Wizard and a Companion which you’ll interchange as your character in any given story as well as a selection of Grogs (along with the other players) which are ‘pooled’ as such so that any one can play any Grog in any given story instead of their primary Wizard/Companion. So you end up with a pool of characters that will appear and be played at various points during the campaign. I really liked (and still like) the idea of a ‘pool of characters’ to choose from as well as the different skill/power levels of each of the character choices. But, as yet, have not managed to play a game of it.